On my first weekend in California I took a pastel workshop up the coast in San Clemente with Dianna Ponting SFCA, PPC, MPAC, PSA. Dianna is the current President of the Federation of Canadian Artists. She has also been awarded the status of Master Pastellist by Pastel Artists Canada and Premiere Pastellist by the Pastel Society of Canada. The class had been booked out for some time with a number of pastellists in the southwest USA anxiously trawling for a cancellation. Everybody was quite taken with the fact that I had come all the way from England for the workshop - although I did say that I had a few other plans for my visit as well! It was great to meet all the people from Wet Canvas behind all the online names - not least my very dear friend Rosa Weitsel, who has now been officially designated by Louise and me as a 'hoot and a half'. I've never sought to emulate the pastel style of Dianna (mainly because I never thought I'd have the patience!) but am always interested to learn new things and wanted to know how she produces the pin point realism of her pastels. how to simplify and exaggerate the reference image while retaining a sense of detailed realism. All the workshop students were able to produce really good work from the reference image during the weekend using very different pastel sets plus a selection of the dark pastels used by Dianna and the tools on her supplies list. All were slightly different - but all demonstrated how they'd built on the lessons learned in the class. Style wise, I'm still not going to try and emulate Dianna - not least because our colour signatures are completely different. However, I'm sure I'm going to be able to use the lessons learned within my particular approach to pastel. I tried to do this on the second day with the pomegranate work at the top of this post - it's a combination of the way I normally work and some of the things I learned during Dianna's workshop. I'd highly recommend a pastel workshop of the sort I attended for those who have found their feet with pastels and want to progress to producing highly finished work of a realist nature. 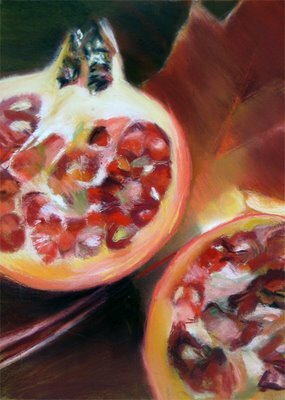 However, I'm sure any artist interested in pastels pastellist will learn something new and of value at one of Dianna's workshops. She is also a well organised and enormously patient and helpful teacher - even with a workshop which has sold out! For those who'd like to register for a workshop with Dianna Ponting, check out her website for details of future workshops (or see the links below) - but do note that most seem to get booked out pretty quickly! 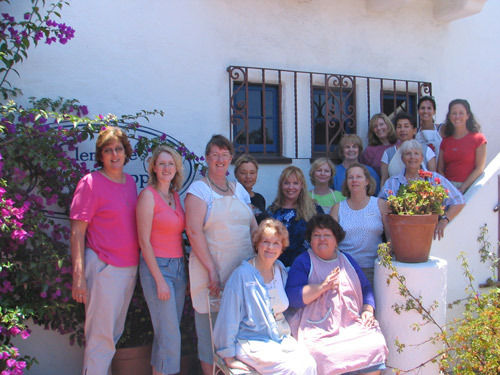 The next one seems to be in Arizona in September and there will be another workshop in San Clemente in July next year. For an alternative perspective, see Louise's take on the workshop in "A Ponting Class". I'm also going to finish with an image of the work she did from Dianna's reference image during the workshop. Bear in mind that Louise doesn't normally work in pastels, learned lots of new ways to work and that I photographed this the next day straight from the workshop - with no final tidying up done as yet! Beautiful, beautiful, lush result from your workshop, Katherine. 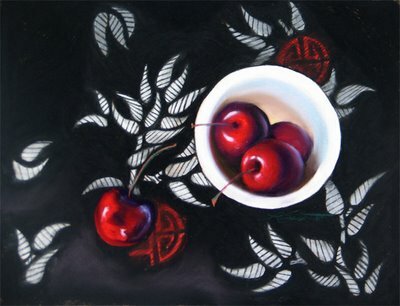 Pomagranates are my favouorite fruit at present and we've just bought a painting of same from a local artist friend. I must say your friend Louise has made a stunning job of those cherries - I can't believe she was using pastels for the first time. Fabulous site - I look more forward to much more. Jeanne - there were a lot of people from Wet Canvas at the workshop so that's probably why you think the faces look familiar. Unfortunately, I failed to make a note of everybody's WC online name!